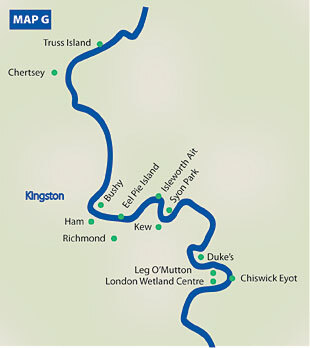 Staines was once the upper limit of the Port of London, so from here to Chiswick can be regarded as the west London section of the Thames. In this section, the large Royal Parks at Hampton Court and Richmond cater for natural historians as well as for those interested in former kings and queens. The London Wetland Centre is a well-known star attraction for birds, but there are small places like Duke’s Hollow that are worth exploring. On the river, the large numbers of cormorants and herons are evidence of an abundance of fish. Between Teddington and Richmond is a unique reach where the tidal gate at Richmond keeps the river level high and only allows the tide to flow up for 2 hours before high water. Once a year, this reach is drained, exposing the riverbed. Below Richmond, the banks continue to have bushes and trees as far as Chiswick, islands and the foreshore providing more natural habitats. Thames Wilderness, All rights reserved.